A celebration and promotion of International Education and Exchange. For more information contact Thomas Torres-Gil at ttorresigil@peralta.edu or call (510) 587-7835. The Office of International Education is celebrating International Education Week! This week long celebration from Monday, November 17-Friday, November 21 is a joint initiative supported by the U.S. Department of State and the U.S. Department of Education to recognize the global exchange environment between the United States and other countries. 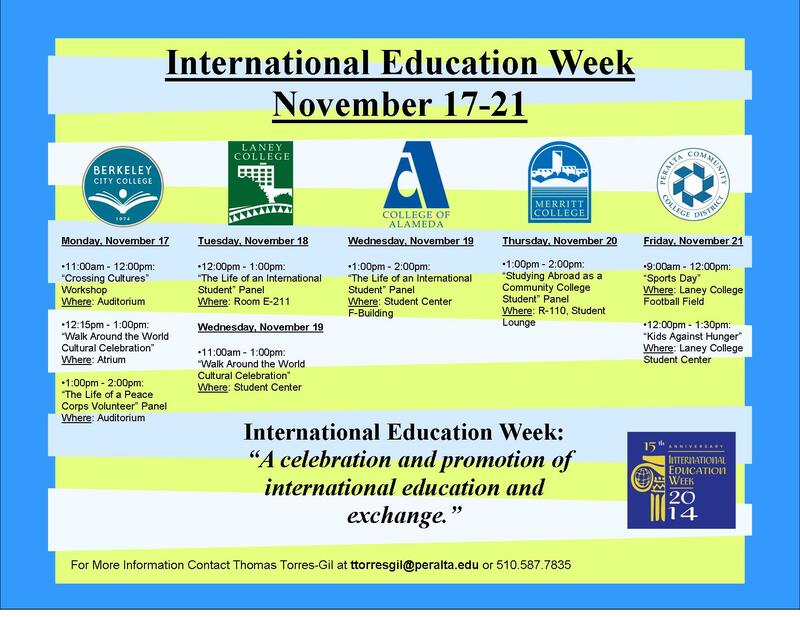 International Education Week is a celebration and promotion of international education and exchange. Throughout the week, the Office of International Education will be hosting a variety of events at each of the four PCCD colleges, including a Peace Corps Panel, a Study Abroad Panel and an International Student Panel. Please come out to learn about how you can become involved with international education!